Tagged under Bishoujo Senshi Sailor Moon, Black Hair, Long Hair, Waifu. Like her element implies, Rei is arguably the most energetic of the Inner Senshi: she will not sit still for even a second and always gets involved in talent shows or shows off her skills. 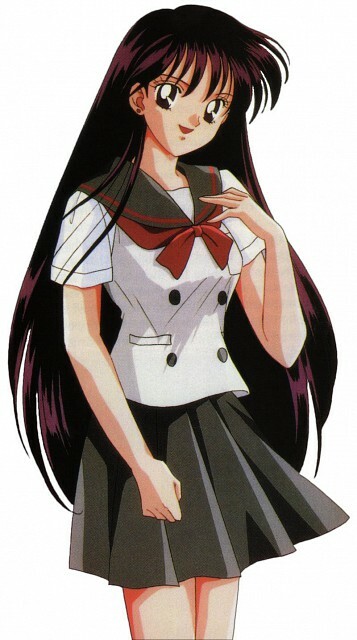 Although she appears arrogant at times and fights with Usagi a lot, Rei cares deeply about her friends and will show her softer side when appropriate. Aside from her duties as a senshi, she also acts as a miko at the Hikawa shrine, where she lives with her (perverted) grandfather. Rei is the third senshi to join the team and her powers are mainly fire-based, but she also displays clairvoyance, the ability to perceive and purify evil, and can catch glimpses of the enemies' plans. In Crystal, Usagi and Rei get along well, with Rei sometimes consoling Usagi and acting compassionate towards her. Rei is notably more composed and seems to harbor a deep distrust of men.